I scored a mandolin around Christmas (the slicer not the instrument) and I had yet to make sweet melodies with it (food not music). Well actually, food IS music to my ears. So yes, I made savory sounds with my mandolin. In my kitchen. Interpret that into what you want. 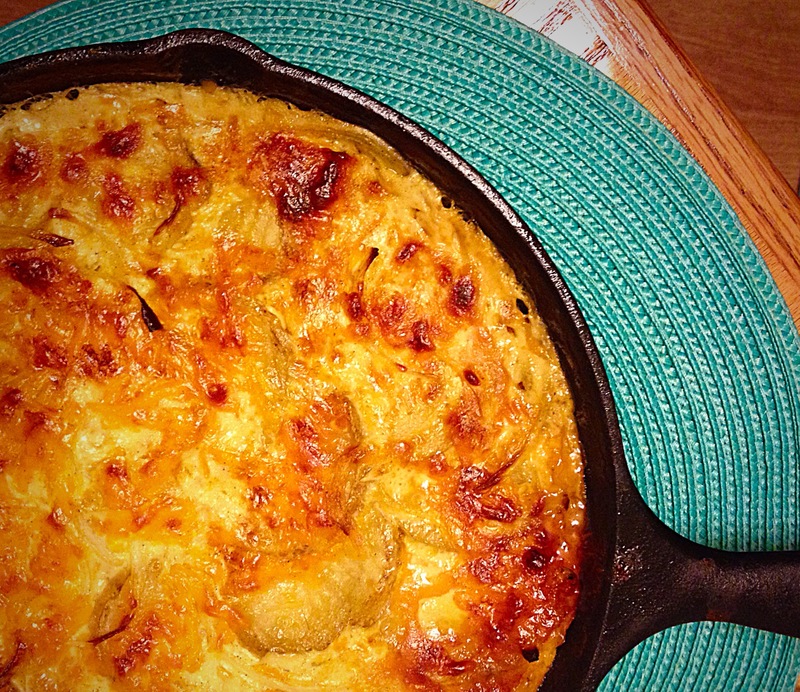 Anyhoo, my boo requested scalloped potatoes with dinner. Apparently, I’ve been “The Carb Nazi” (his words). So I threw in the towel and obliged. This recipe couldn’t get any easier. It’s versatile as well, meaning you can create your own version. Add some diced ham, peas and top with sour cream for an entire meal! All in one pan! Tonight, I made pork chops and applesauce. So my potatoes only scalloped with eachother… all by themselves. Like I said, this recipe is as easy as 1-2-3. And just to prove it, i’ll keep the directions down to three steps. I’m assuming you have your mise en plas ready and willing. Step 1- In a large bowl, toss the potato slices in the flour. Whisk the evaporated milk, whole milk, thyme, garlic powder, salt and white pepper in a separate mixing bowl. 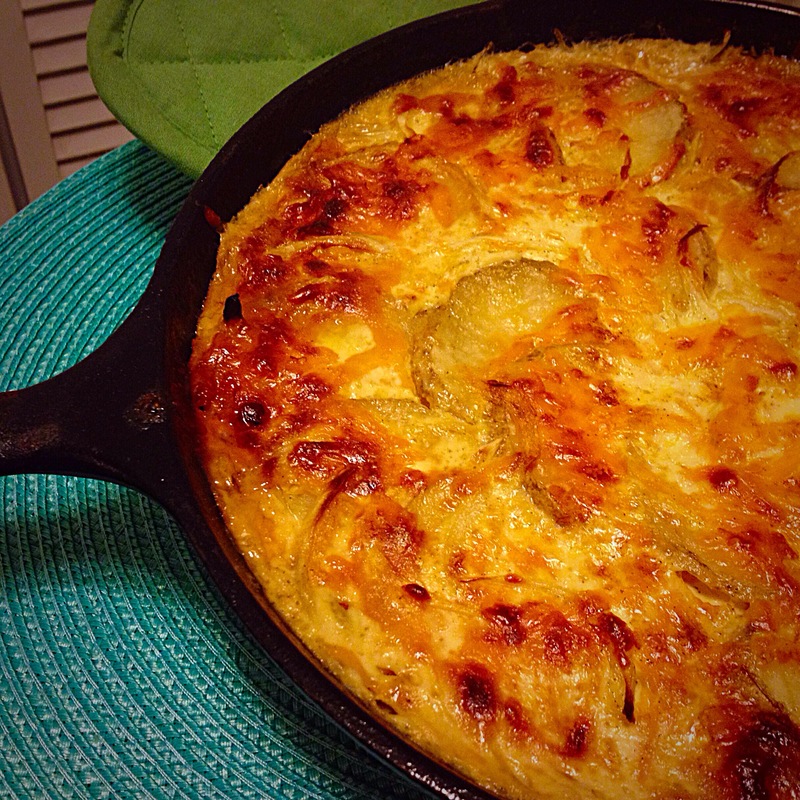 Step 2- In your seasoned and buttered cast iron skillet, layer the following ingredients in this order: half of the floured potatoes, half of the onions, half of each cheese. Repeat. Just sprinkle the extra flour, left in bowl, throughout the layers. Step 3- Pour evaporated milk mixture over top of potato/onion/cheese layers. Cover in foil. Step 4- Bake on 375 degrees for an hour. Remove foil and bake 30 more minutes until the top is a nice bubbly, golden brown and the potatoes are fork tender. Let sit 10-15 minutes before serving. I know. It takes forever to cook. And there was 4 steps…. But you can’t rush a masterpiece. You can, however, cut cooking time by par-boiling the potato slices. This entry was posted in Comfort Food, Dinner, Food, Holiday cooking, Recipes and tagged evaporated milk, scalloped potatoes. Bookmark the permalink.